Showing your children how to enjoy life without electronic devices is important. 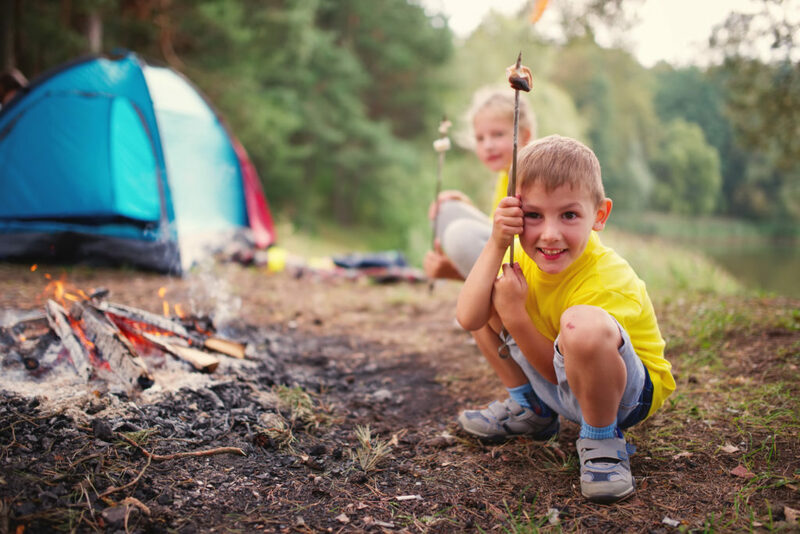 With these helpful tips, camping with kids will be a breeze. The average teen spends up to 9 hours on media every day. Shocking, isn’t it? Whatever happened to riding bikes and playing tag with the neighbors after school? There have to be better options for how our kids spend their time. If you want to get your kids outside, try introducing them to the joys of camping. Camping is one of America’s favorite summertime activities. Don’t worry, it’s not as hard as you think. Packing for a camping trip is overwhelming. Especially if you have a crew of tiny humans coming along. Those little humans seem to be very demanding. Make life a little easier by putting together some checklists of things to take camping so you don’t forget any essentials that may cause middle-of-the-night meltdowns. A few weeks before your trip, start writing down things that you will need. Give yourself a few days to work on the lists. This way you can add anything that you may have forgotten. Make a food list, a clothes list, and an equipment list. By breaking them up you will be able to stay organized and make packing easier. Need to buy some great equipment? See more here and soon you’ll have a foolproof system with all the gear you’ll need. It’s best to have a campsite reserved before you go. That way you won’t end up driving around an extra hour trying to find availability. For the best reservations, you’ll have to play ahead. Camping sites in national or start parks fill up quickly. You may need to book up to six months in advance for those parks. Check into the site to see if you’ll need any additional preparations. Will you need a permit? What is there to do? Will you need lake/swimming accessories? And while you’re checking out the area, you make want to think about emergency preparedness? Where is the nearest hospital? Will you have cell phone coverage? Know what to do or who to call in an emergency can make a big difference. In an ideal world, the sun will be shining, the kids will be happily entertaining themselves, and you will get to relax and read a book. I hate to pop your bubble, but that most likely will not happen while camping with kids. When it comes to camping, expect the unexpected. This means sudden changes in weather. And when you are camping with kids, it’s best to be prepared with rain gear and cold-weather accessories. At the very minimum, include a winter hat, warm coat, and boots for every member of the family. Also, make sure you have a place you can go to keep dry if the rain doesn’t let up. Have an organized meal plan. Plan each meal of every day so you know exactly what you need to do to prepare. There’s nothing worse than little kids asking what’s for dinner, when dinner will be ready, and telling you how hungry they are over and over. To prevent this, try to keep to the normal eating schedule as much a possible. Also, make foods that they will actually eat. And always have enough snacks on hand. Because we all know that hungry kids equal grumpy kids. You would think that “camping” is enough of an activity, but this is a great time to spend some quality time together doing some fun stuff that you don’t get to do at home. Remember night games as a kid? Camping is such a great time to play games such a Ghost in the Graveyard or Kick the Can. And to really get in the spirit of camping, how about No Bears Are Out Tonight. And what better time to have a lesson on constellations? There are no city lights to diminish the lights from the stars. So if you are lucky enough to get a clear night, have everyone lay on their backs and point out easy to find constellations such as the Big Dipper and Orion’s belt. I know, this sounds crazy, but hear me out. About a week before your trip, practice setting up the tent with the kids in the backyard. This will help you make sure that you have all the pieces to your tent, and teach your kids what they will need to do to help set up camp. Take it one step farther, and let everyone sleep in the tent for the night. This will greatly reduce any amount of anxiety that your kids may feel from the new experience. Camping is dark. There are no hall lights your kids can turn on if they get scared. Give each of them a flashlight and let them get used to using it in the tent. Helping your kids gain confidence in sleeping in a tent will allow your camping trip to run more smoothly. Now, this is important. No electronics. For anyone. Including the parents. For a successful, memorable camping trip, it’s important that everyone unplugs and spends quality time together. What good would all this preparation and planning be for if everyone just sat around and looked at their phones? I mean, you can do that at home without all the extra work. So leave the phones in the car, pull out the Uno cards, and play a game together instead. I promise this is what your kids really want to do and will mean the most to them. Camping with kids can be a lot of work, but it also creates the best memories. Take advantage of the time you have with your kids and spend some quality time with them in nature. And if you’re looking for any other family advice or activities for children, come check us out. We understand how stressful parenting can be. That’s why we’re here to help in any way we can.